Ok look, we aren’t entirely sure how we went from writing about Gaming Hardware to writing about Toasters. But i cannot in good conscience let a gaming toaster go, especially if said toaster comes from the gaming giant Razer. Well i can’t say this is something i have drooled over – infact i didn’t even know i wanted it till i saw it. 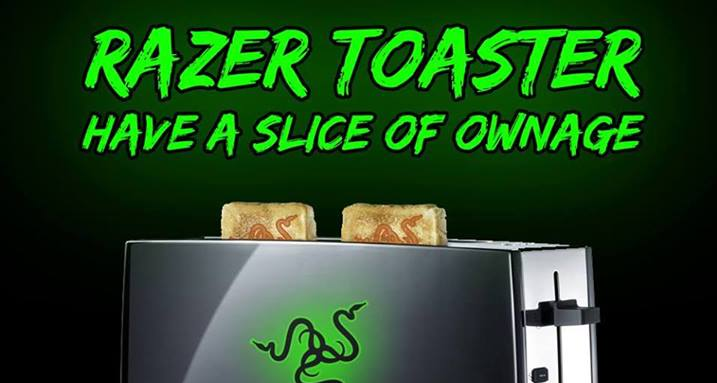 But hey, its the Razer Toaster, and it prints the Razer logo on any slice you toast, who wouldn’t want it? So heres the deal: Razer’s CEO promises to make the Razer Toaster a reality if its official Facebook page gets 1 million likes. Like we said this is a Kickstarter without money. The name of this Gaming Toaster is Saturnus aka Razer Toaster aka the Razer Gaming Toaster. We have to admit though it looks pretty insane, not to mention absolutely awesome. We cant wait to have our slices toasted with the Razer Logo and eat a true gamers breakfast. Though the design and features will only be confirmed by Min Liang Tan (Razer’s CEO) after the group reaches 1 million likes, some pretty nice concept art and features have begun to popup. The features should include different toasting options and progress bar according to the official concept art. The Razer Toaster will also have a brushed aluminum case according to the same official feature list. Some other concept arts have also been posted on the site. Thats all folks, dont forget to head over and like the official page!